It’s been a while since we have discussed Universal Orlando’s tippy top secret new park being built just off of Destination Parkway in Orlando. No formal acknowledgement of plans or even construction have come from Universal Orlando as of yet. The park is still years away, but the overall master plan seems to be locked in to place. So why not share what we know? As always, keep in mind that nothing in today’s article is confirmed officially by Universal Orlando. Thus, take the information presented here with a grain of salt until actual details are revealed. That said, this particular story is one we have followed for two years. And while things surely can (and do change) at the last minute, we think it’s important to document how attractions and parks evolve into what they become opening day. So let’s dive in! 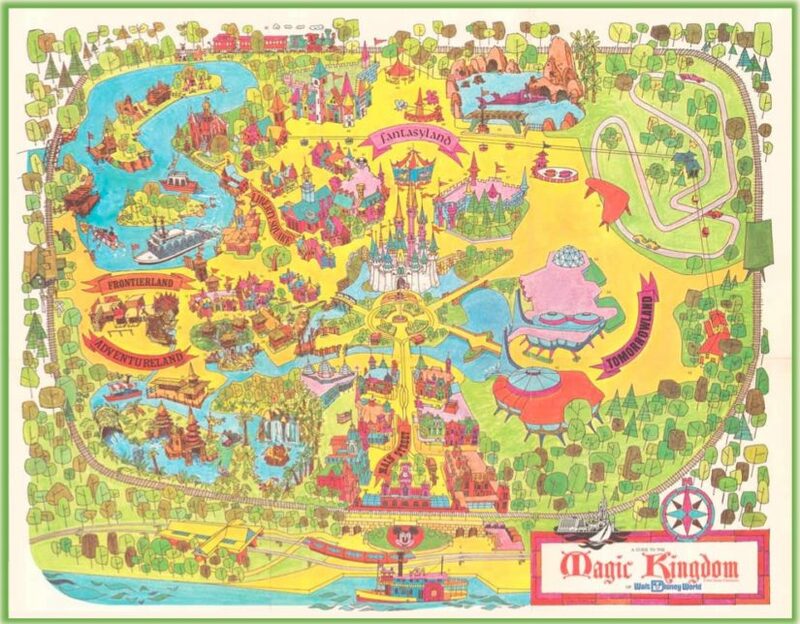 As we have alluded to in the past here at Theme Park University, the master plan for Fantastic Worlds is indeed unique and in some ways revolutionary. You may have heard murmurings that the overall design of the park follows a hub and spoke design. This is actually true, but not in the sense that you may be thinking. First of all, for those that don’t know, a hub and spoke design is most often referenced to Disneyland and all of the Magic Kingdom parks around the globe. Guests enter a main artery (Main Street) into a central hub. From there (like spokes on a wheel) they can choose which direction they can go from the various lands beyond that central hub. Now, in Disneyland if you wanted to travel from (as an example) Adventureland to Frontierland you can do that without having to go back to the main hub via several different pathways. In Fantastic Worlds? Not an option. 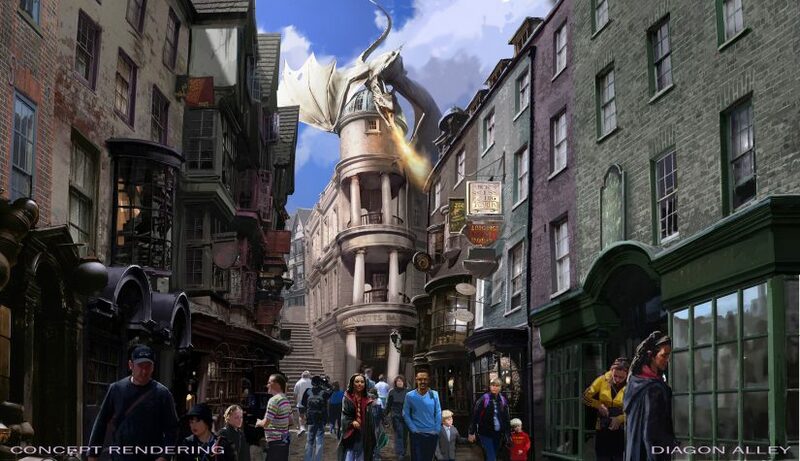 You know how Diagon Alley at Universal Studios Florida is kind of it’s own “bubble”? There is one entry point and one exit point. Once you are within the land, you are completely immersed in all of the attractions, shops and entertainment. You can’t even see the rest of the park from Diagon Alley. It’s one of the reasons the land works so well. Even though San Francisco and Men in Black are adjacent to Diagon Alley at Universal Studios Florida, you have to go back to that main walkway in the park to go anywhere else. This is how every land in Fantastic Worlds will be set up. One central entry and exit point. In this case, let’s say that you’re in the World of Nintendo and you want to jump over to Universal Classic Monsters. There will be no way to cross from within those lands to get to one or the other. Instead, guests will need to go back and visit that central hub. A few notes about the image above. Yes, I know it’s horrible. It’s also not to scale. However, it is the layout of Fantastic Worlds. Don’t read too much into the sizing or exactly where things fall in the quick sketch I put together above either. Let’s dissect it and see what it means! The red rectangular area is your main hub. It’s pretty massive (larger than Magic Kingdom in Orlando) and will feature shops, dining, entertainment and a few attractions. Here is the fascinating part: you don’t need a ticket to enter the main hub of Fantastic Worlds. Keep in mind, plans can change, but as of the writing of this article the “hub” of Fantastic Worlds will serve as a sort of CityWalk 2.0 for the new property. Unlike CityWalk, it will have a more cohesive theme to help support the park. However, anyone can enter this area via the purple arrows at the bottom of the drawing. This particular idea of having a non-ticketed hub for a theme park has actually flip flopped since it’s inception. Once this particular master plan was bought off, the concept of a non-ticketed hub was given the green light. Then Universal changed direction and considered making it a traditional gated hub. Unfortunately, this is the only plot on the property to have any kind of “CityWalk” area with shops and dining. Anything beyond Fantastic Worlds (yes, there is much more slated for this property in the future) doesn’t exactly have room to have another location of shopping, dining, etc that is open to the public. Back to my crude drawing. 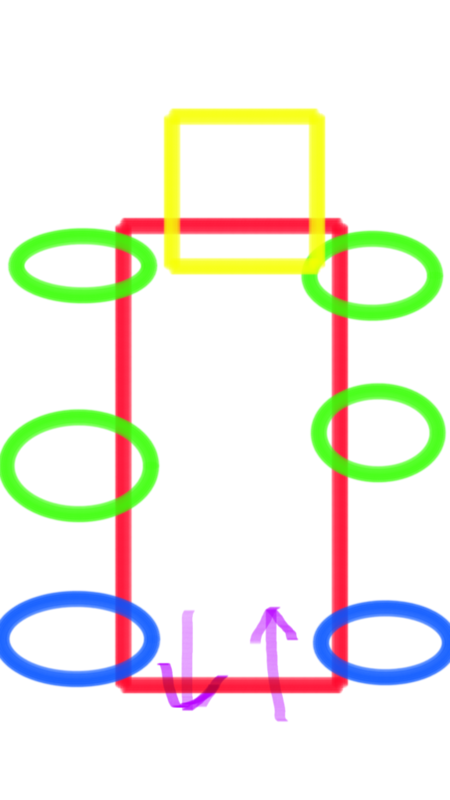 Now that we have established that the hub is in red and your main entrance is at the bottom (purple arrows), that leaves us with those ovals. Those are the individual lands for this park. The ones in green will be ready on opening day and the blue are marked for future expansion. Green ovals include lands themed to: Fantastic Beasts, Universal Classic Monsters, Super Nintendo World (full scope) and How to Train Your Dragon. Each land will have several unique attractions, specialty food and drink, etc. We will cover this in a future article. Just like any other theme park, one ticket will be required to enter. The difference being anyone can enter the main hub (CityWalk 2.0), but your ticket will be scanned at the entrance of each land in order to enter the actual “park” of Fantastic Worlds. The rectangular yellow box in the back? That’s a fairly massive hotel that overlooks the entire park. Rather than place it at the front and block your view of the park upon arrival, this hotel actually will serve as a backdrop of the entire project. It also allows guests to pay good money to look down into the park once it opens. We are going to go into much more detail about how this park is forming in future articles. Again, this is all subject to change since the target opening date is 2023. However, from what we have heard it hasn’t wavered too much in roughly two years since the inception of this project. What are your thoughts? Is a non-ticketed hub a good thing? Will you be more likely to visit Fantastic Worlds knowing that each land will be in it’s own “bubble”? Would love to hear your thoughts on this. This entry was posted in Universal and tagged Fantastic Worlds, Universal Orlando. Bookmark the permalink. Trackbacks are closed, but you can post a comment.